A rose and a Snapple for my Dad. 2016. My Dad was the recipient of two Purple Hearts and a Bronze Star. During the Korean War, he was a forward observer, which meant he had the job of going in front of the front lines, laying the radio cable with which they communicated, and observed what the enemy was doing. Sometimes he disappeared for a while, with no communications home to my Mom or to his Mother. Before he left f or Korea, my Dad got engaged to my Mom, married her on his last leave, June 17, 1951, and spent time in California training. At first, I think because of his advanced age, he was almost 23, he taught map reading to new recruits. Dad loved to read maps. Honestly, I think GPS systems would have driven him crazy, as paper maps have almost vanished. For Dad a map was important. His time as a instructor was limited. One day during exercises, an officer insulted my Dad, making anti-Semitic comments and making fun of the mezuzah he wore around his neck. Dad was not a tall man, but he was a big man. He tackled the officer and broke his jaw. He was lucky, his commanding officer, a Captain, saw the incident. He and several others hustled Dad back to camp. As far as anyone was concerned, Dad was not there when the Lieutenant had his jaw broken. But Dad was demoted a grade and sent to Korea. He always said that the USA paid for his first cruise…to Japan and then to Korea. Dad’s first Purple Heart came when they were going up a hill. His group was being bombarded. The noise was horrendous. Years later when Dad saw “Saving Private Ryan,” he discussed that noise. The movie brought back his memories, as he was part of the amphibious landing in Lochi. My Mom said he cried during the opening sequences. Dad was injured on the hill. Shrapnel entered his legs. He was bleeding. His friends cried out, “Rosie! Get Down! You are wounded! Medic Medic!. “ He said he did not even feel the pain in the rush to get up the hill. It was Dad’s first visit to a MASH unit. Needless to say, Dad loved the television comedy M.A.S.H. The MASH doctors fixed Dad up and he went back to war. Years later the shrapnel began to exit his legs, causing him much pain. Besides being a forward observer, Dad was a radio man. He laid wires and fixed faulty wiring. He received a citation for bravery for fixing wiring at the base during a bombardment. He was up on a pole fixing it, while bombs fell around him. My brother disagrees. He says yes it was a unit award, but was not for Inchon. They were actually in the mountains and were abandoned by the South Koreans. The unit got the Bronze Star for this mission, for fighting their way back to their encampment and surviving. His second Purple Heart got him the trip home. This time by plane to Hawaii and the big pink military hospital on the hill. (I waved to it when I went to Hawaii 17 years ago. Dad asked me to do that for him.) Then to California and one to Massachusetts, where Mom was able to meet up with him. She always said that Dad was not the same person when he came home. She would say that he was not a human being. That it took a full year for the real Donald to come back. Dad was the kindest, gentlest man. He loved people. He loved his family. But his time in the army changed him. Certain noises would impact him. Military movies made him cry. He went to pay respects at the Korean War Memorial in Washington, DC, as well as the one here in Kansas. At both he cried for those who did not come home. 2017 Remembering my Dad and Mom. Two roses. On Memorial Day, I always think of my Dad, and all the others who served our country. 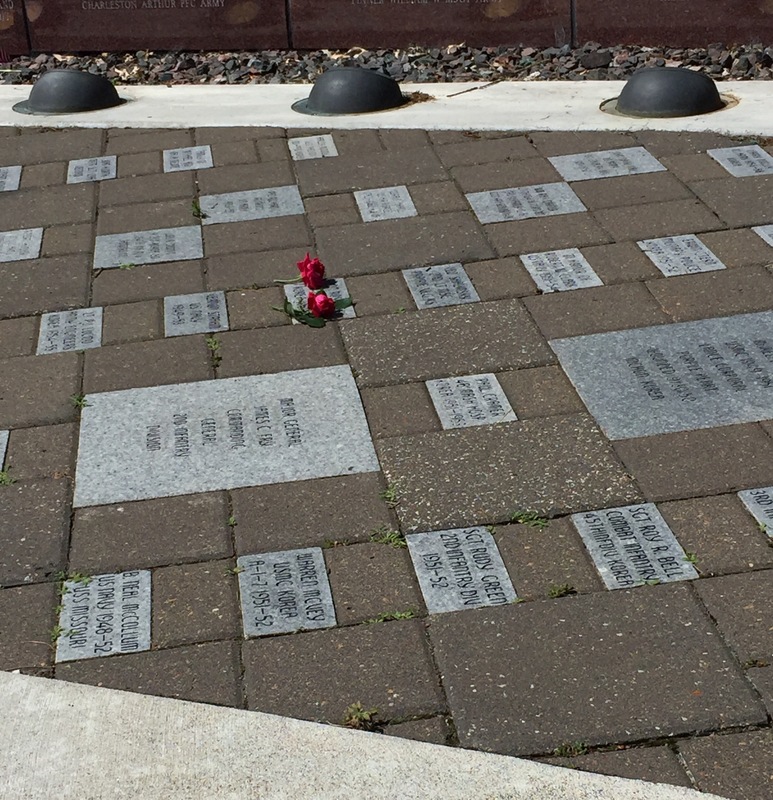 I go to the Korean War Memorial near my home and put roses on the stone I put in for my Dad. Roses for Rosie….and I drink a diet peach Snapple, his and my favorite drink. Many grateful thanks to your Dad for his service and courage. My Dad was also in Korea from 1951 to 1952; a surgeon stationed with the Korean Marines. I still have a box of shrapnel he removed from wounded soldiers and brought home with him, along with his Bronze Star medal and Korean Choong Moo medal. Interestingly, my Dad didn’t find Mash funny at all – perhaps it was too close to home. Thank you so much for sharing your memories. As a surgeon there, your Dad saw the horrendous injuries. My Dad as a patient only saw the kindness he received as an injured soldier. I am married to a physician, and he hates medical tv shows. I’m happy your Dad found kindness. And yes, my Dad thought medical TV shows were awful. He would be horrified by today’s drug ads, as well. Lol. My husband hates them. Ask your doctor comments make him rant! Your post as always touched me deeply. Your love and respect for your father are so obvious, and the description of the effect the war had on him is so devastating. My father, who was in the Navy at the very end of World War II (he was born in 1926) was one of the lucky ones who never saw combat, never went overseas. I can’t imagine what impact it would have had on him. My parents married in September, 1951, just a few months after yours. And maybe we’ve already discussed this, but in the continuing series of small world coincidences we share, my husband went to DeWitt Clinton HS—-long after your dad, obviously, but it was still all boys and by then a pretty rough school. He was in the scholarship program there and loved it—said it changed his life and for many years stayed in touch with his teachers from Clinton. Where did your dad live in the Bronx? My husband grew up on Andrews Avenue near the old NYU uptown campus. My cousins went to DeWitt Clinton as well. More in your husband’s age. Dad grew up near Prospect Ave. you could see the apartment on the highway that leads to the GW bridge. Harvey graduated in 1971—last name is Shrage. Bruce graduated in 1972 or 1973. Bruce Levy. I will ask. He still lives in NY area. Will email him. And yes I keep thinking we are connected somewhere. Well we are a little. Thank you for sharing the details of your father’s service. It’s so important that we don’t forget the sacrifices and the scars of war. I am honored to see a glimpse of his goodness through your words. Thank you. My Dad was a good and special person. But I admit to being biased. However, he was rich in his friends because he believed in helping others.